A Girl Scout can choose between this or the Contemporary Membership Pin - Item # 09014. It is worn on the Insignia Tab on the left side of the uniform, centered above the heart. A Girl Scout can choose between this or the Traditional Membership Pin #09001. It is worn on the Insignia Tab on the left side of the uniform, centered above the heart. Show off your love of Camp Four Echoes with this brand new pillow! These pillows are also available at the Camp Four Echoes Trading Post! 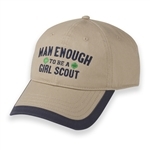 A sturdy and handsomely-designed baseball hat for the guy who’s “Man Enough to Be a Girl Scout.” Khaki with navy trim. Six-paneled construction. Navy embroidery verbiage on front with green trefoils. Adjustable strap at back with metal sliding buckle. Cotton canvas. Imported. 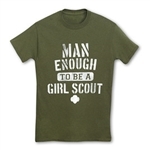 Show everyone you're "Man enough to be a Girl Scout" and proud to wear this T-shirt! Comfortable cotton tee with distressed screenprint. Olive green. Imported. With ToGetHerThere.Org imprint. Assorted, we'll select. Imported. 100% silk. 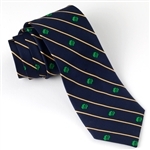 In navy with gold stripes. Imported. 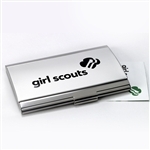 Carry your business cards in style with the Girl Scout business card case. Flip open and close case with Girl Scout Servicemark imprint. Metal. 3 3/4" x 2 3/4". Imported. White sticky note cube with all over trefoil and "Girl Scouts" design. 550 sheets. 2 3/4". Imported.